Superconductors.ORG herein reports the TeBCO family of superconductors has been expanded to include three new variants. And a new method of synthesis has been found that increases the volume fraction tenfold. TeBCO was first discovered in April 2013 by Superconductors.ORG through substitution of tellurium into the yttrium atomic sites of long-chain YBCO molecules. With an ionic radius of 0.97Å, tellurium was almost guaranteed to go into the same atomic sites as yttrium (0.90Å). However, the +4 oxidation state of Te required longer barium and copper chains. 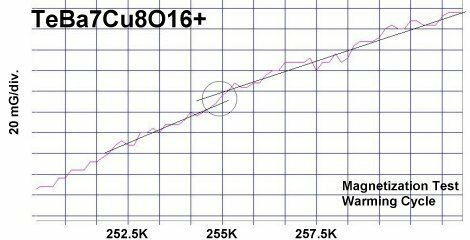 Then, in the upper left plot, two phases resulted from the compound TeCaBa4Cu6O14+. There is a stoichiometric phase near 99K and a minority phase near 111K. 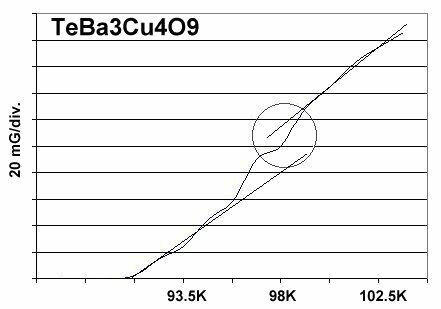 The dominant 99K phase results from alternating Te and Ca in every other anion site. This is the classic 1212C structure characteristic of YBCO. 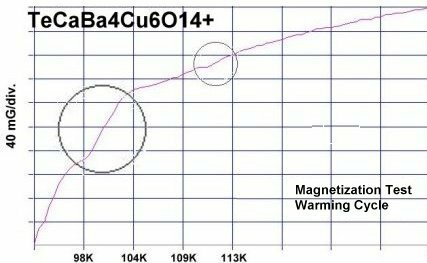 It does not require longer barium and copper chains since the +2 oxidation state of Ca complements the +4 oxidation state of Te. In other words, two atoms with +4 and +2 states have the same net doping effect as two atoms with +3 states when applied across two unit cells. (See graphics below.) 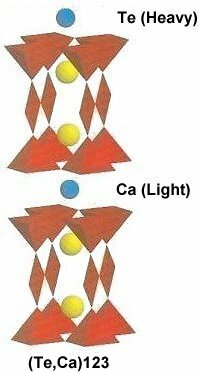 Another advantage of using calcium is the improved transport properties across grain boundaries. Meanwhile, the 111K phase is likely a 1212C/3212C intergrowth that formed as a byproduct. A magnetization plot from the original TeBCO discovery, made in April of 2013, is shown below. The low volume fraction of superconductive material in the prototype was the result of a low-temperature sinter. To avoid melting the TeO2, the sinter was performed at 720C for 204 hours. And even after such a long time, the sinter was incomplete, producing a greenish-colored pellet. It has since been found that TeO2 can be calcined like CaCO3, with a pre-sinter. The procedure is noted below. ...and the below ratios for (Te,Ca)123. The chemical precursors were mixed and pelletized at 60,000 PSI and pre-sintered at 720C for 8 hours. Then the mix with calcium was calcined at 770C for an additional one hour. Finally, the pellets were sintered at 880C for 10 hours. The pellets were then annealed for 10+ hours at 500C in flowing O2. Testing temperatures were determined using an Omega type "T" thermocouple and precision OP77 DC amplifier. The magnetometer employed twin Honeywell SS94A1F Hall-effect sensors with a tandem sensitivity of 50 mv/Gauss. 1. Testing temperatures are believed accurate within +/- 0.50 degrees C.